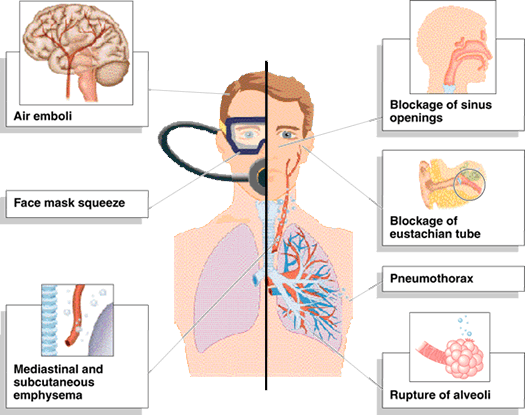 Barotrauma is pressure injury associated with diving. 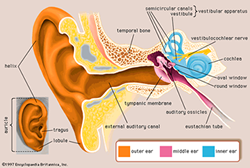 It can occur in the ears, sinuses, or lungs. Middle ear barotrauma is the most common side effect of inability to equalize ear pressure during diving. This can result in typpanic membrane rupture and the more serious manifestation of round window rupture. Most cases can be treated with nasal decongestants, steroids and antibiotics. ENT surgery may be required. 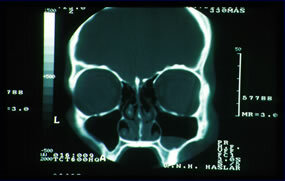 Sinus barotrauma is the second most common related complication of diving. It is frequently associated with upper respiratory tract infections or allergic rhinitis. Once a sinus squeeze begins the only way to get relief is to ascend or decompress. Physical examination may show a sinus that will not transilluminate with light and is associated with a sinus fluid level. Sinus barotraumas should be treated with prophylactic antibiotics to prevent sinusitis. Pulmonary barotrauma is secondary to POIS or pulmonary overinflation syndrome. POIS is caused by expansion of gas trapped in the lung during ascent or over pressurization of the lung with subsequent overexpansion of rupture of the alveoli. The two main causes of POIS are excessive pressure inside the lung caused by positive pressure or failure of gas to escape from the lung. POIS can occur from breath holding during ascent. Involuntary causes include chronic obstructive pulmonary disease with blebs or bulla, asthma, thick pulmonary secretions, or coughing or sneezing during decompression. Pulmonary Overinflation Syndrome due to breath holding or rapid ascent can lead to alveolar rupture and the complications of Pneumomediastinum, Pneumothorax, and Arterial Gas Embolism (AGE), as pictured above. The clinical presentation is that of an unconscious surfaced diver. Pneumomediastinum is due to pulmonary overinflation syndrome in which there is alveolar damage and subsequent leakage of gas from alveolar spaces into the mediastinum. The gas travels along tissue planes were can reach the neck, face, abdomen and even limbs resulting in subcutaneous emphysema and tissue stretch. Concommitment pneumothorax is seen in up to 32% of patients. 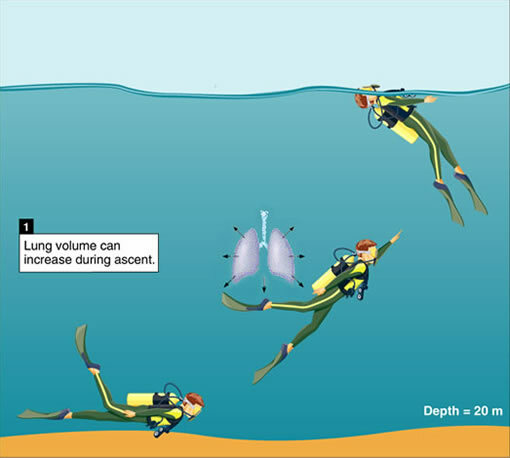 Pneumothorax or lung rupture and collapse is a serious diving injury. Signs and symptoms include chest pain, back pain, and cough. There is frequently jugular venous distention with associated decreased cardiac output and hypotension. There is marked tachypnea or shortness of breath with shallow respiration. Breath sounds are frequently absent on one chest side but this finding cannot be relied upon. Chest x-ray shows a pleura shadow or hyperlucency and absence of vascular markings. Pneumothorax is frequently caused by uncontrolled ascent or breath holding on ascent and is associated with the development of a cerebral arterial gas embolus as gas enters the arterial system. The common presentation is that of a diver that surfaces and rapidly becomes unconscious, frequently with an associated seizure. Immediate chest tube placement, oxygen, and recompression is needed.